While the Winter Olympics is in full swing in PyeongChang, South Korea, and many winter sport fanatics head to snow-clad mountains to get their thrills on the slopes this ski-season, this dramatic mountain scene is somewhat off-piste – in Saturn's rings to be precise. These fluffy peaks are among the tallest seen in Saturn's main rings, towering as high as 2.5 km above the plane of the rings, a significant deviation from the vertical thickness of the planet's main rings, which is generally only about 10 m. They rise abruptly from the edge of the B ring to cast long shadows in this image. But these mountains are far from solid: they are constantly changing accumulations of ring particles that respond to the gravity of moonlets and wave-like formations induced in the rings. 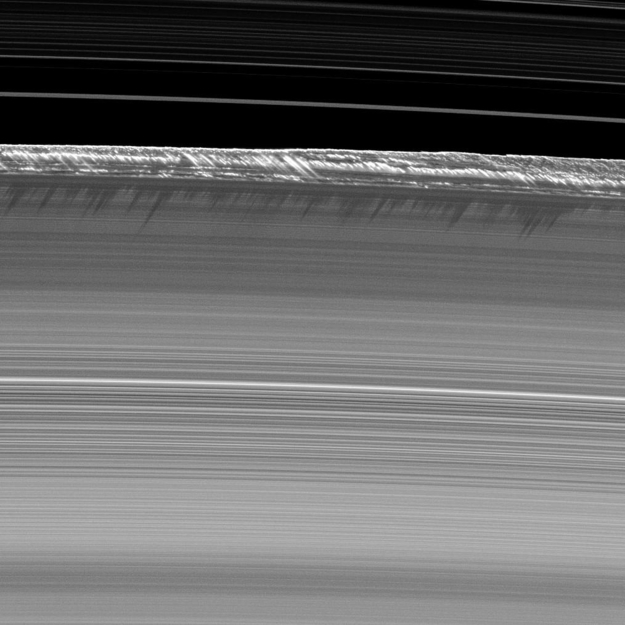 Part of the Cassini Division, between the B and the A rings, appears at the top of the image, showing ringlets in the inner division. This is one prominent region at the outer edge of the B ring where moonlets up to a kilometre or more in size are found. It is possible that these bodies significantly affect the ring material streaming past them and force the particles upward in a 'splashing' manner, in reality making them impossible to ski. Images like this are only possible around the time of Saturn's equinox, which occurs every half-Saturn-year, or about every 15 Earth years. The illumination geometry that accompanies equinox lowers the Sun's angle to the ring plane and causes structures jutting out of the plane to cast long shadows across the rings. This image was taken by the international Cassini spacecraft's narrow-angle camera on 26 July 2009, two weeks before the planet's 11 August equinox, as the Sun shone directly edge-on to the ring plane. This view looks toward the southern, sunlit side of the rings from about 32° below the ring plane. The view was acquired at a distance of 336 000 km from Saturn and at a Sun–Saturn–spacecraft angle of 132°. Image scale is 2 km/pixel and the image captures a 1200 km-long section arcing along the outer edge of the B ring. The image was previously highlighted in a release on 1 November 2010. The Cassini mission is a cooperative project of NASA, ESA and Italy's ASI space agency. The mission concluded in September 2017.